1 How can estate agents benefit from SEO? How can estate agents benefit from SEO? Modern estate agencies have realised that ranking on Google for relevant terms is massively important in order to compete. Well-executed SEO will result in an estate agent website capturing the interest of a prospective buyer, seller, landlord or tenant. The ultimate goal is for those searchers to find your site amongst all the competition and get in touch. In this guide I will be showing you how your estate agency could have more property on the market and more buyers finding you, with the effective use of SEO and the tool I use to help. 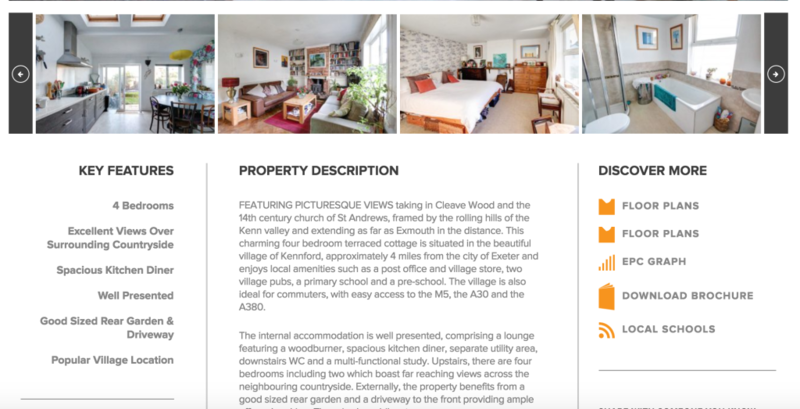 I will then finally share some results and evidence of my own SEO put to use to get an estate agent website from page 4 to page 1 in just four months. By using premium SEO tools like SEMrush, you are able to know (to the nearest ten) how many people search for what keyword each month in Google UK. Business owners often have an idea of the most popular searches their prospective customers are inputting into Google, only to find out they may have been targeting the wrong term. What this means is that many estate agents want to rank in Google for a variation on the obvious primary keyword, that may have half as many people searching for it as a different variation of the same keyword. Luckily in the estate agency industry it is very easy to know what most people search for by using a tool like SEMrush, as you already roughly know the keyword they would be searching for. On some occasions I opt to target a term with a lower search volume if the competition is fierce, but more often than not I suggest to go for the highest volume term. At this point I can use the SEMrush tool to get the real/accurate position of where your site ranks for the target keyword. Remember, you may think you are on page one already but it is Google showing a biased result based on your search history and location. One of the most common downfalls of SEO in this industry is neglecting the keyword ‘houses for sale in (your city)’. You ideally want to be able to rank your homepage for the ‘estate agents (your city)’ keyword and have a property search page ranking for ‘houses for sale in (your city)’. This is important because there are more people searching for ‘houses for sale in (your city)’ than estate agents (your city). Attracting both search terms is going to help your business grow. Even though we understand Rightmove and Zoopla have become known for the place to find properties, Google is still seeing large volumes of people searching the term instead of going right to these two property search giants. Another commonly untapped area of SEO for estate agents is how individual property listings are optimised. Renters and buyers are using Google to search for specific requirements such as ‘4 bedroom house with garden to buy Brighton’. This also means home owners are searching for comps and carry out these same searches – if your site appears, then you could have secured a lead. More on this later in the guide. One of the first things any SEO working on an estate agents website needs to do is effectively target the primary keyword you have chosen, through the homepage. This means using the keyword in the key elements of the homepage: Your title tag is the most important element to address. This field you will find in the backend of your website is sometimes called meta title, title tag or page title. It best to start with something simple that hones in on the target, like ‘Estate Agents (your city) | (your company)’. This information will not show up on your webpage, but will be visible in Google and is the clickable blue part in the search results. Next is the H1 tag, sometimes called heading / heading 1 or name. This field will be visible text on the homepage, so many people would opt to make it something that includes the words from your target keyword with additional words. The reason for this is due to branding and messaging – many directors of estate agents would not be comfortable with a prominent heading to a page simply reading ‘Estate Agents (your city)’. To compliment your keyword targeting you need to consider that Google loves portions of text content. Like many industries, estate agents like to keep the focus on visuals – a slider full of properties in the area or a slider with call to actions to a property search page. Many estate agents even go straight in with the property search function at the top of the homepage. All of this is fine, as long as you get some unique text content on the homepage. You need to try and incorporate the target phrase or variation of it at least once. Every time you upload a property listing to your site you have the opportunity to make your site’s SEO better or worse. Just like you did with your homepage, you need to create a title tag and a h1 tag. Think like a searcher and construct the title tag and h1 accordingly to reflect the offering of this page. Don’t try and cram in your primary keyword in an attempt to rank higher, as this hold back the homepage. Writing unique property descriptions is very important, albeit time-consuming, it means that you are able to captivate both the site visitor and the search engine. Just 100-200 words per property is all you need, but without it you are not going to attract those searchers who know what they are looking for. By studying many estate agent websites I have also found that Google likes those property listings that use bullet points for the property’s key features. You can also get the edge by using your h1 text as the name of the image you upload and then variations for the name of subsequent images of the given property. These are known as alt tags and allow Google to rank your property in Google Image search, as well as giving the property page itself a better chance of cutting through the competitors. As a property comes off the market you naturally want to remove it from the website. When you delete a listing you create a ‘404 error’ – this is essentially a dead page. Google does its best to remove these listings out of Google, but the bi-product is that a large volume of dead pages leads to worse SEO, as Google sees this as poor management of your content. You need to (301) redirect the page to your main property page so that there is no 404 error. You may have also been fortunate and had another website link to your property listing before it expired. This could have passed SEO value from their site to yours and if the page is ‘dead’ then the value can’t pass into your site and help it rank. It is also useful for anyone who bookmarked a property listing from your site or emailed it to their partner – if it now expired but redirected then at least they are more likely to search the site to try and find a property. When you upload a property listing and you also have the listing firing off to your Rightmove account, you may not be aware that Rightmove could be getting all credit from Google. Due to Rightmove being respected by Google and constantly analysed by the Google crawler, if your listing goes on to Rightmove the same day then there is a high chance Google will see it on their site first. To combat this I would recommend that you submit your newly published listing to Google via the Google Search Console. Many estate agencies will have never even set their GSC up, and should do as soon as possible. Once set up you go the ‘crawl’ section on the left hand side and select fetch as Google. You then enter the remaining portion of the url after the homepage and click ‘fetch’. Finally, you click ‘index’ and you will have prompted Google to look at your new page and view you as the original publisher of the content. Once you have sorted the basics of your onsite SEO you want to look at the links pointing to your website. Before you get stuck into building links to your site, you should analyse the current links you have. To do this I use a premium tool called ahrefs. This allows me to find your links and audit them – carefully analyse which of the links have helped you get to the position you are for your primary keywords. I then find the ones which are either risky or clear culprits for your hindered performance. Since September 23rd 2016 Google has made the analysis of your links more important than ever, meaning your rankings are more sensitive to the links you currently have and the ones you will acquire. 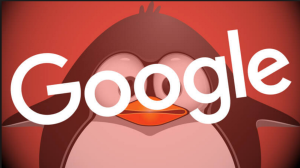 You can read more about Google Penguin Real Time here in my free guide. If your company has multiple offices in the country or across a region, then it makes sense that you would like them to all get visibility on Google. 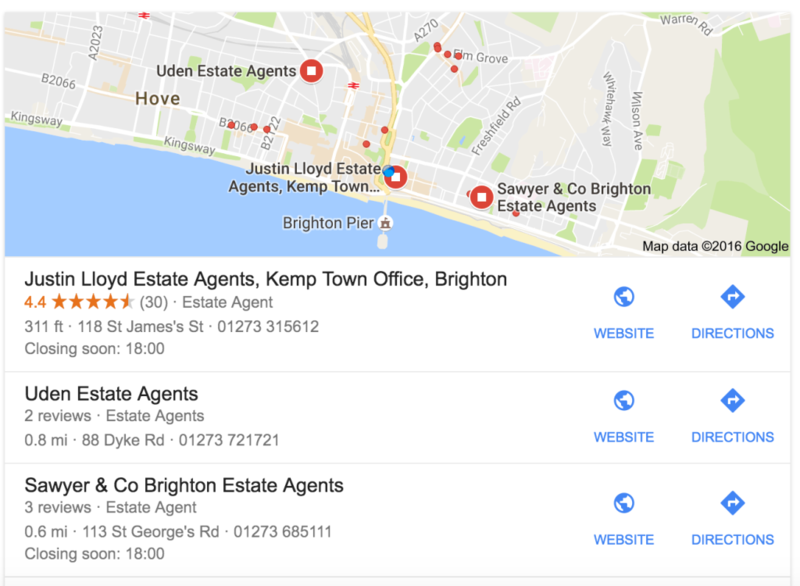 If you are aiming for your homepage to rank for the people of Brighton, but you have an office in Hove, another in Portslade and one in Worthing, then it is unlikely that the homepage can rank for all the keywords for the different areas. Each of the offices need visibility in order to compete and for the company to keep every office open. As the case was with the homepage in terms of title tag, h1 tag and text content, the landing page for a second office needs optimising too. Commonly, you could also get away with more text content on this office page, which will give you the edge in its ability to rank. One of the most common mistakes people make here is copying text from one location page and only changing the location name in the text. This makes it extremely difficult for Google to rank you for your second, third or forth office because it is sighted as duplicate content. You need to create unique content for each office page. The quality and volume of links pointing to your site will always matter and have a direct impact on your rankings. Even established estate agent websites can have seriously under-developed backlink profiles, meaning that even with good onsite SEO (discussed above) the competitors out-rank them because they have more links that are valuable. Not having enough links is a better problem to have than having lots of bad links, but it does mean you need a clear link building strategy in order to gradually get those page one rankings. Once again, I use ahrefs to compare how many links your site has and how many the page one sites have. I also look into how many of those links are nofollow – meaning the site linking to you chose to tell Google not to pass SEO value to you, and how many are dofollow (pass SEO value to your site). You need to also understand the quality of those links your competitor has, compared to the quality of your links. On many occasions I have seen sites with just 10 links outrank a competitor with 100 poor to mediocre links. When you use SEMrush to get an accurate list of who the top 10 competitors are for your primary keyword, you can then head to ahrefs to uncover which links have helped them get this ranking position. To do this, you place their domain name in ahrefs’ – ‘Site explorer’ and click ‘ explore’. You then click the ‘Backlinks’ tab on the left and you will be presented with all the links ahrefs could find on the Internet, that point to your competitor. If you then click the ‘Link type’ tab and choose ‘Dofollow’ you will see the links that pass SEO value across. If you open another tab for ahrefs and do the same for your site, you can get a picture of the difference in volume of links. Through inspecting different estate agency link profiles I have found that those who sponsor local events, sports clubs and charities seem to have better organic rankings. This is due to Google seeing the relevancy of those local sites as well as the fact that these sites often have a lot of links pointing to them. Good quality directories allow you to list your business details and website address. This allows Google to have greater confidence that you are a real business operating at said address in your target area. The important thing here is unique company descriptions on each directory, consistent use of company name, accurate address and the inclusion of your website link. If you produce a quality piece of content that would appeal to the HR department of your local university then you could be referenced by them and secure a very powerful link. Universities work hard to create content aimed at students and the parents of students about student housing, the area and off-campus housing. If your content would be useful to this demographic and good further reading then this strategy is worth approaching. Every estate agent comes across that one property which has some unusual selling points or is really valuable. Like any listing you could create the page for it on your site and in terms of SEO, just let it be. 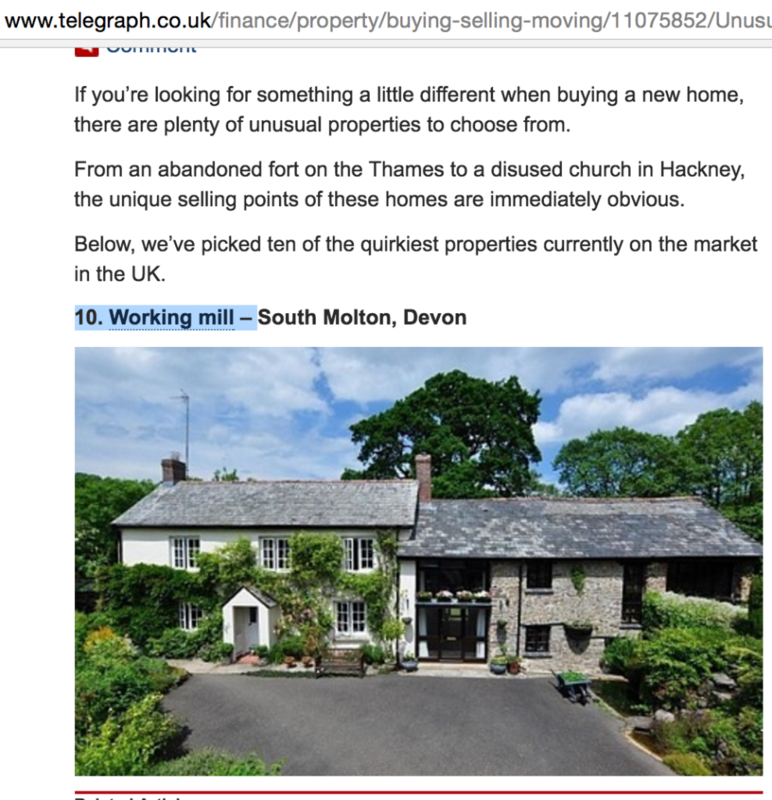 Some estate agents are having their property featured on extremely powerful newspaper websites in articles like ‘Top 10 Unusual Homes for Sale in the UK’ (telegraph) – each property has a link to a Rightmove page, Trovit page or an individual estate agent’s property listing. 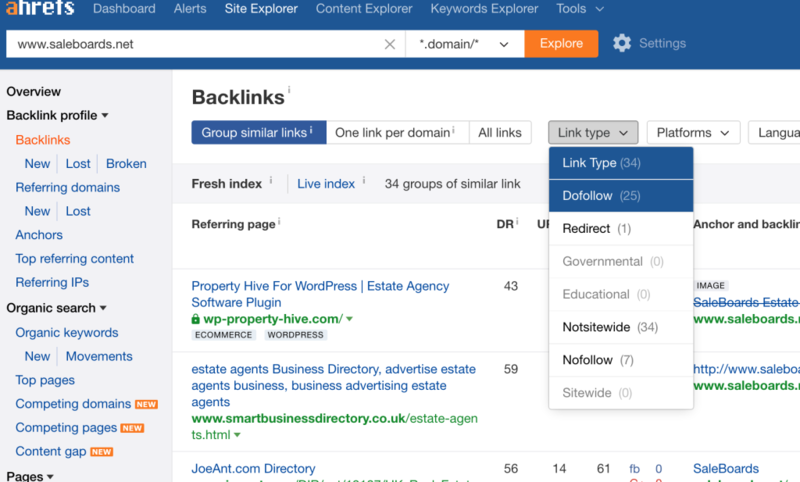 Due to properties being sold or coming off the market many of these links point to ‘dead’ pages without a redirection in place. This does leave room for an SEO to approach the editor and let them know that half the links point to dead pages and that you have an interesting property for them to include instead or as well as the current ones. Once your unusual property page expires you will still take home the link value from the newspaper site if you redirect the old url to your property search page. Aside ranking your website organically in the top 10 search results, you have another way to increase leads – Google My Business. 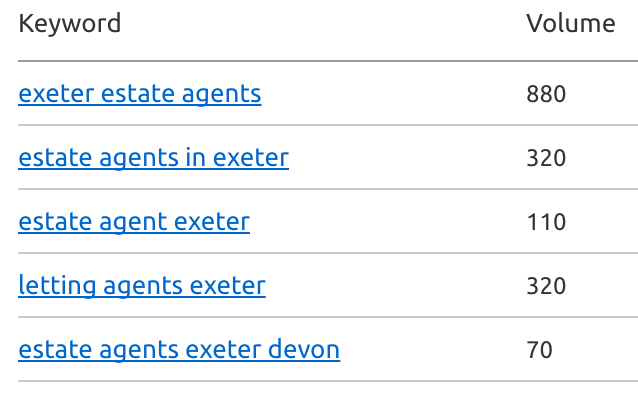 You can recognise these GMB listings if you search for ‘estate agents (your city/town)’ and look below the ads at the top. Most estate agents seem to have a Google My Business account and just a couple of reviews. 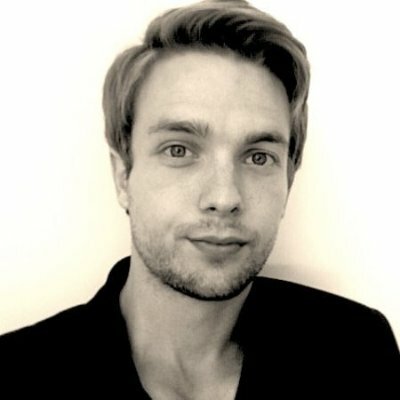 More competitive areas of the UK have listings with more reviews and smaller, less competitive areas have listing showing up without any reviews. Make sure the address on the listing matches your address on your site. Make sure you added yourself to the right category (Estate Agent). Start by adding your business name and adding Estate Agents at the end of the name (don’t put the location keyword at the end). Get over 5 reviews to start with and you get your star rating which entices more people to click through to your website. Try and get a couple more reviews each month until you surpass the amount of reviews the companies who show on page one have (usually 3 spaces available). If you achieve a position in the 3 GMB listings then you will have an instant rush of new website visitors. It also helps through increasing the likelihood of someone clicking your organic result as they often won’t click the GMB listing but then see your organic listing and are convinced. Four months progress has shown the key term has grown from position 37 (actually 34 due to tool counting GMB listings as organic) to 13 (actually 10). An SEO should be able to handle all of these tasks but also help you know of internal processes in your estate agency that will help grow and sustain your SEO. This includes guidelines for your content production for property listings as well as discussing your contacts and leveraging them to secure links. Commonly an initial 6 month agreement should be enough time to show significant growth in your rankings compared to your pre-SEO search positions.